Getting anywhere in Washington DC traffic can be a nightmare, even if you’re the leader of the free world and have a motorcade at your disposal. But at least the president can hop aboard Marine One (the fleet of presidential helicopters) and rotor to his next appointment instead. 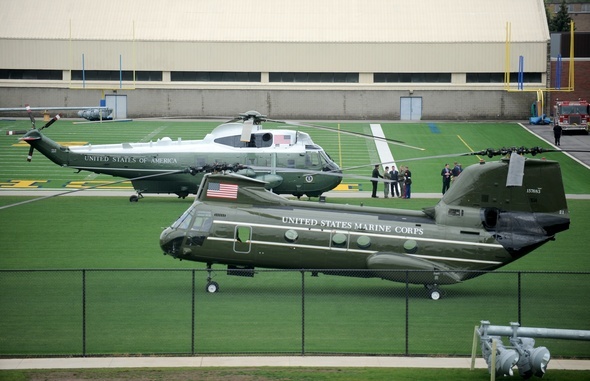 The VH-3D Sea Kings that currently shuttle the POTUS around have been ready for retirement since 2003. So why has it taken so long to find a suitable replacement? 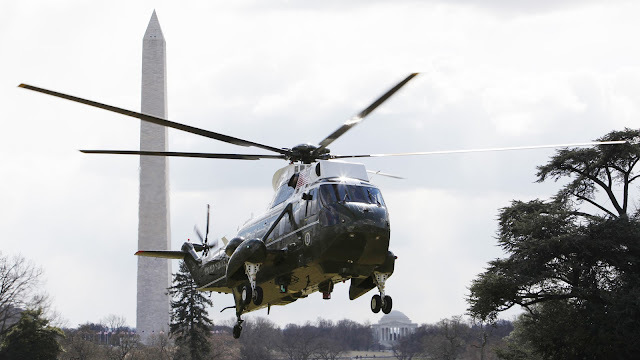 The presidential fleet does include a few VH-60N “WhiteHawk” helicopters, which are newer and slightly smaller than the Sea King, however the VH-3D constitutes the operational backbone of the group with 11 units in all. The VH-3D is a derivative of the Sikorsky SH-3 Sea King, a medium lift transport chopper that’s been in service since 1961. So by the start of the 21st century, the Sea King was nearing abdication and the Marine Corps started looking for a replacement. 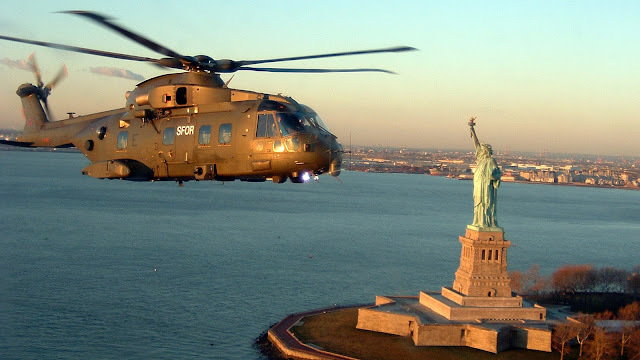 In 2003, the DoD issued a Request for Proposals (basically an open solicitation bid sent out to defence contractors when the government wants new gear) for 23 new helicopters to replace the entire existing fleet — Sea Kings and NightHawks alike — designated the VXX proposal. 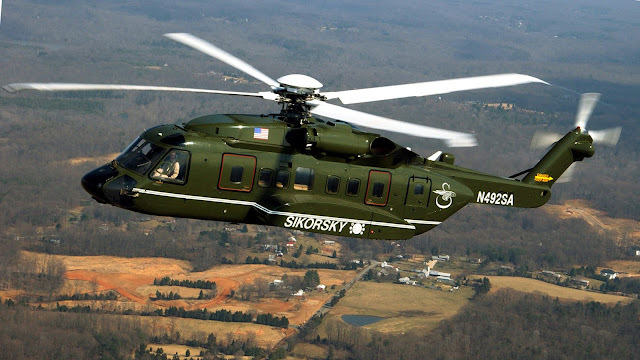 Only two groups responded: Sikorsky (working with GE, Northrop, and others), which proposed a derivative of the H-92 Superhawk and chopper transport of choice for many heads of state; and AgustaWestland (along with Bell and Lockheed), which put forth the VH-71 Kestrel an American version of AugustaWestland’s very successful EH101 Merlin medium lift helicopter. 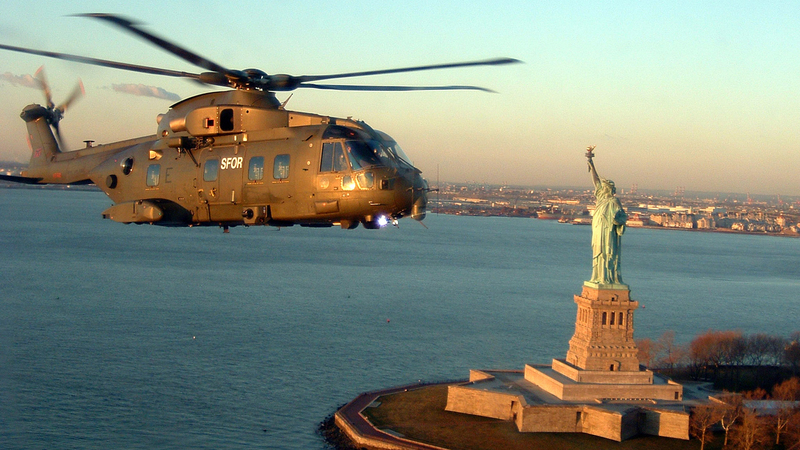 By January 2005, the Navy decided to go with the VH-71, redesignating it the US101. This 18-seat (4 crew, 14 passengers) all-weather helicopter measures 64 feet long and 22 feet high with a 61-foot rotor diameter powered by three 2,520HP GE CT7-8E turboshafts. It was originally designed as a Combat Search and Rescue platform. The Navy awarded the initial $US1.7 billion contract to AugustaWestland, pre-production design began, and that’s where the trouble started. The project was immediately beset by cost overruns, and by 2007 — two years its kickoff — the development and retrofit costs alone had ballooned by 40 per cent ($US2.4 billion) over initial estimates. By 2008, building the entire fleet of 23 whirly-birds would cost a staggering $US11.2 billion — $US400 million per bird, about what an Air Force One 747 would run you — up from $US4.2 billion just three years before. This near-tripling of cost did not sit well with the newly elected Obama administration. Running on a platform of change and fiscal responsibility after nearly a decade of ongoing military incursions into the Middle East, the incoming administration viewed the bloated VXX program as a meaty means of demonstrating both campaign promises to a waiting American public. Despite the Navy in 2008 giving the go-ahead on the project (knowing full well about exorbitant cost), the VXX program ended in February 2009 — after the price had risen again to a solid $US13 billion — at the behest of President Obama himself. Instead, he directed that the remaining funds being applied towards upgrading the current Sea King/NightHawk fleet. Simply solution, right? Not quite, said the Congressional Research Service. The CRS ran the numbers on the President’s plan and discovered that axing the VH-71 and retrofitting the VH-3D would, in the long run, end up costing the US taxpayers somewhere in the range of $US14 billion – $US21 billion — not to mention the $US3 billion they’d already blown on the Kestrel R&D so far. A savings bonanza, it was not. Plus any future fleet purchases wouldn’t be affordable until at least 2024, by which point the Sea Kings would be nearly eligible for Social Security. Instead, the CRS put forth a four-option proposal for moving forward with a variation of the existing Kestrel program: One, continue the Kestrel model as currently developed (the Increment I and II versions, think of them as progressive prototype revisions). This option would cost about $US10 billion and have the choppers in the air by 2019. Two, build 23 units of just the Increment I Kestrel. That would cost only $US6.4 billion and would have had them ready by 2012. Three, build just 19 Increment I’s for $US5.9 billion and also be ready by last year. Finally, spend just $US1.4 billion to upgrade the existing Sea King fleet though that wouldn’t actually satisfy any of the requirements for future presidential helicopters and would still need to be replaced in the coming decades. By the end of 2009, the White House and DoD had reached a decision on the program. Upon signing the joint House and Senate Defence Appropriation Bill for FY 2010, the president sealed the fate of the VH-71. The bill appropriated $US130 million in total for the VXX program. $US100 million went towards recouping the programs various technology R&D costs while the remaining paid the Navy for its initial program studies. The administration was washing its hands of this R&Debacle, there would be no Kestrel for the foreseeable future. 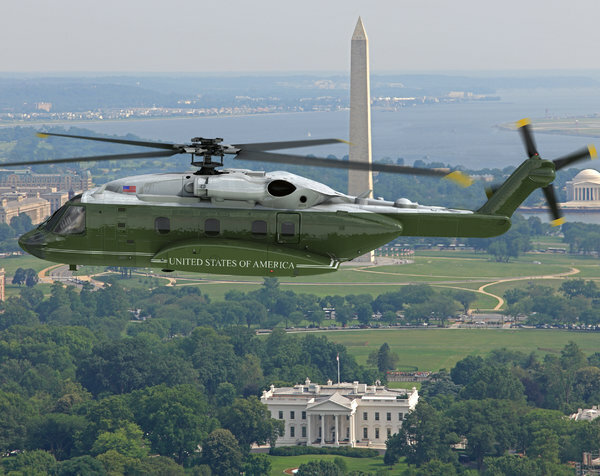 With the program effectively back at square one, the US Navy published another RFP for a next-gen presidential helicopter. Lockheed quickly jumped ship and signed on with Sikorsky’s proposed S-92 while Boeing has made a few vague rumblings about taking up with AugustaWestland to give the VH-71 another shot (and if not the Kestrel, perhaps an Osprey or a Chinook). Whether or not the program moves forward in the next few years makes no difference to the nine VH-71s that had already been completed when the program was led out behind the woodshed. In June of 2011, the US government sold them to Canada for a tidy sum of $US164 million (more than paying for the FY 2010 appropriations tab). They’ll be used for spare parts for our Northern neighbour’s existing fleet of CH-149 Cormorants, another SAR derivative of the AH101. Word is, Canada might be eyeing them for use as VIP transports as well.